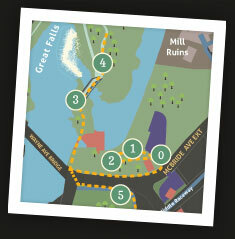 Mill Mile is a self-guided walking tour and educational platform intended to teach students and visitors about the remarkable history, geology, social and cultural importance of the area around the site of the Paterson Great Falls National Historical Park. Woven throughout Paterson’s history are powerful themes, including immigration, economic opportunity, innovation, social justice, sustainability, and the arts—themes that we can use to help better understand and interpret the area’s unparalleled significance, and to make the history more relevant to all visitors, especially young Patersonians. As you walk Mill Mile, you will learn how each of these themes tells a different story about the forces that shaped the city and the nation as whole. 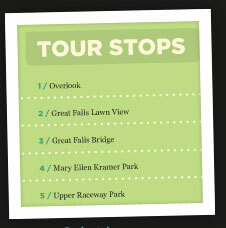 We invite you to spend an hour or two touring the Great Falls, one of the few sites in America whose natural beauty is matched by its historical significance. This walking tour follows the route by which America’s first hydropower system powered the Paterson mills for over 100 years. Along with the majestic views of the cascading water comes the story of America. After the birth of the nation and long after the British surrendered, ending the Revolutionary war, America remained heavily dependent on England for virtually everything from clothing to military supplies. Alexander Hamilton recognized that America never could be truly free from Britain, nor from any other foreign oppressor, as long as our nation remained dependent on foreign goods. As the first Secretary of the Treasury, Hamilton created the strategy to secure economic independence and founded the City of Paterson — 15 miles west of New York City and home of the Great Falls, then the country’s largest waterfall in volume and width after Niagara — to begin his plan. Hamilton selected Pierre L’Enfant, the architect who had just completed the street layout for the nation’s capital, to devise a plan for Paterson that harnessed the power of the Great Falls for future factories. And he drafted the documents for the first corporation in New Jersey — the Society for Establishing Useful Manufactures — that would provide power from the Great Falls for more than 150 years. Enthralled by the raw energy that coursed through the Passaic River and down the precipitous drop, Hamilton envisioned it as the source of power for the new nation’s first planned industrial city, where invention, labor, and commerce would spark America’s transformation from a rural agrarian society based in slavery into a modern economy based in freedom. True to Hamilton’s vision, Paterson became a great manufacturing city, powered by the renewable energy that Hamilton first saw at the Great Falls. Driven by his deeply held belief in the value of hard work rather than inherited privilege, Hamilton saw Paterson not only as the city that would plot the course for the nation’s economic independence, but also as the city that would promote unprecedented opportunities for immigrants and poorer classes. As Paterson’s founder, Hamilton championed the spirit of enterprise and opportunity that transformed this nation into a great economic power. And today, with the Great Falls at the heart of America’s newest national park, you can explore the streets, factories, and homes where this transformation took place. The Great Falls Historic District has always been a mixed-use area with mills, housing, schools, taverns, and shops. It remains that way today and is alive with local people and businesses that have adapted the buildings to contemporary needs. The architectural history is utilitarian and functional. Note the use of local brownstone at the base level of many buildings. This stone is found in local quarries just to the south of the Falls. Observe how the raceway system was linked to the buildings using outbuildings and connectors. Take a look at the oversized piers that dominate the style of Paterson’s industrial textile buildings. They tell the tale of “arms of iron in a glove of silk” (one of Paterson’s mottos) and the strength of the workers who built them. Be sure to take a careful look at the residential buildings that are interspersed among the mills. They constitute some of the oldest housing in the nation, with much of it dating back to the 1830s. Imagine the numbers of families who have called these buildings home and the generations of immigrants who have called Paterson their hometown, rushing to the city whose modern economy was the first to provide opportunities for immigrants. The difficulties of mill life, so easy to romanticize now that the soot has settled, are evident in the buildings that were a part of the residents’ daily existence. One cannot ignore the strength of these structures that have withstood years of heavy use, often followed by additional years of neglect. Many are coming back into their own as they are renovated, and examples of adaptive reuse abound throughout the district. In the following sections of the Mill Mile website you will learn about renovations throughout the historic district that have sought not to bring back the past, but to improve the quality of life for today and the future. Click here to watch Smokestacks and Steeples: A Portrait of Paterson, a short documentary by William Paterson University professor Vincent N. Parrillo that traces the development of manufacturing in Paterson.